Couldn't resist a little gold dipping! I hope all of you who are mothers, children or fur babies, had a wonderful Mother's Day. With my hubby and son out of town, my beautiful daughter took control. We got up early and drove west to pick up my Mom and then we drove back and then east to go and have tea with my mother-in-law. Too very happy ladies and so glad that they get along so well. Brooklyn worked in the afternoon but came out after with purple tulips and this gorgeous card that was in the husband's kit from Kim Heggins. 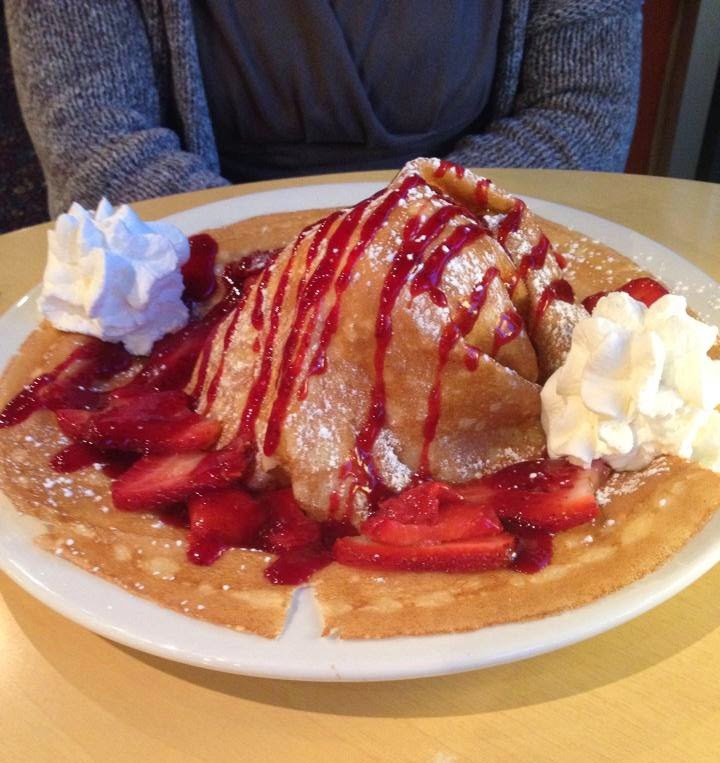 Then she took me to Caffe Demetris dessert restaurant and treated her mama to this, underneath that big hump in the middle was white chocolate ice cream. Yes I did eat it all. Love that girl to pieces, she knows me too well! Sounds like a wonderful girls day Tracey!! Love your gold dipped feathers. A simple yet striking design! Looks like a yummy dessert too, I adore fresh strawberries! 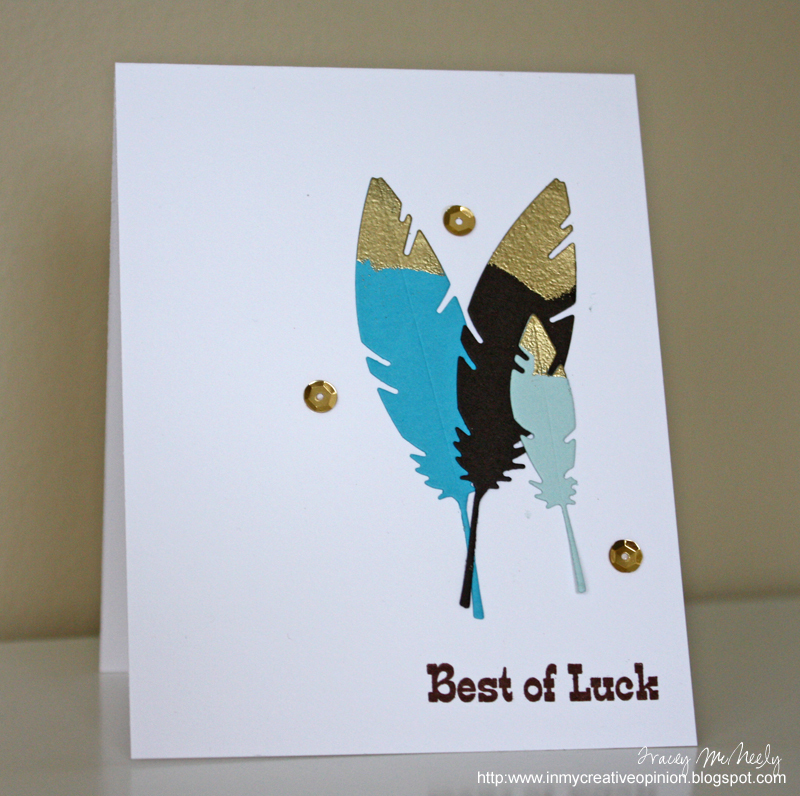 Love your gold-dipped feather card, Tracey! This (inlaid) diecut is awesome! Gorgeous use of colors! Glad that you had a beautiful Mother's Day celebration! You are so loved and sure deserved it all! HUGS! Wow! 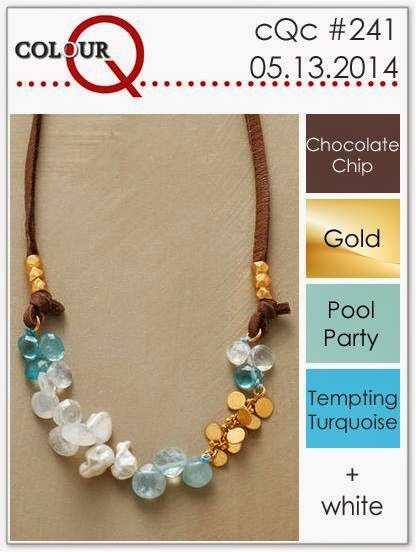 Those colors look amazing with the gold, Tracey! Awesome card! So nice to hear you had a wonderful Mother's Day! Oh my goodness....gold dipped feathers! So stunning and so perfect for you card. Your card is ever so stunning, Tracy! What a wonderful Mother's Day; time with your mom and MIL, as well as with your daughter. That dessert...WOW! You more than deserved the spoiling and pampering, my friend! I am so glad your beautiful daughter took charge. Not a little girl anymore:( Happy you had a great day! I love all my daughters in laws too. Love the gold dipped feathers so pretty . The card from Kim is beautiful and such a fun idea. Oh, those gold dipped feathers look amazing, Tracey! Love how you added the gold to the feathers.. brilliant.. totally love it..
Love the gold dipped feathers and of course your yummy dessert!! I'm so happy that you had such a lovely Mother's Day! You have such a wonderful family...wow! I love how you played with the challenge colors on your card, Tracey! Your feathers are so pretty, and of course your CAS design is perfection! Sounds like you had a wonderful Mother's Day. As did I. Your gold dipped feathers are gorgeous, Tracey, but they are completely overshadowed by that amazing dessert! LOL! Wowsers!! Sounds like a great day! I loveeeeeee your card ... those feathers are FABULOUS!!!! What a fabulous mother's day you had. I cannot believe you ate that entire desdert! Love the Mother's Day card that was in your kit, too. I think Kim has spoiled you! Awesome card, Tracey--love the gold dipped feathers! Fabulous dessert too!! So glad you had a wonderful girls day out for your special Mother's Day! 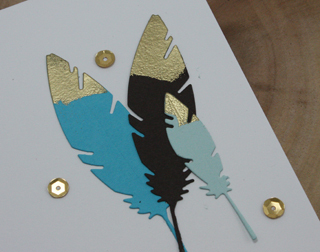 Awesome feather card...love the gold! Sounds like you ladies had a terrific time! That dessert looks amazing and so is the card! What a wonderful day full of love for you Tracey! And what a stunning card for us today, I love the embossed tips of your feathers. I like this colour combo this week, it has sparked an idea, let's hope I get time to put that idea into action!! Love the gold tipped feathers! Fabulous use of the colours and yeah for a great Mother's Day. Impressed you ate the whole thing! Love the blue feathers dipped in gold :) So glad to know that u had an amazing day! Sounds perfect, Tracey! I soooo wish my mom and mother-in-law got along. Gosh, what I wouldn't give for my mother-in-law just to accept me. And your card is so pretty! LOVE those dipped feathers! Oh I LOVE this Tracey - looks like those feathers have been dipped in real gold...gorgeous! Your gold-dipped feathers are beautiful. I love turquoise and brown together. So pretty.